Def Leppard are an English rock band formed in 1977 in Sheffield as part of the new wave of British heavy metal movement. Since 1992, the band has consisted of Joe Elliott (lead vocals), Rick Savage (bass, backing vocals), Rick Allen (drums, backing vocals), Phil Collen (guitars, backing vocals), and Vivian Campbell (guitars, backing vocals). This is the band's longest lasting line-up. The band's strongest commercial success came between the early 1980s and the early 1990s. Their 1981 album, High 'n' Dry, was produced by Robert John "Mutt" Lange, who helped them begin to define their style, and the album's standout track "Bringin' On the Heartbreak" became one of the first rock videos played on MTV in 1982. The band's next studio album, Pyromania, was released in January 1983, with "Photograph" and "Rock of Ages" as the lead singles. In the U.S., Pyromania was certified diamond (10× platinum), making Def Leppard among the most popular music groups at the time. In 2003, the album ranked number 384 on Rolling Stone's 500 Greatest Albums of All Time. Def Leppard's fourth album Hysteria, released in 1987, topped the UK and U.S. album charts. As of 2009, it has reached beyond the success of Pyromania, having been certified 12× platinum for sales of over 12 million in the U.S. and has gone on to sell over 25 million copies worldwide. The album spawned seven hit singles, including the U.S. Billboard Hot 100 number one "Love Bites", alongside "Pour Some Sugar on Me", "Hysteria", "Armageddon It", "Animal", "Rocket", and "Women". Their next studio album, Adrenalize (the first following the death of guitarist Steve Clark), reached number one in UK and U.S. charts in 1992, and contained several hits, including "Let's Get Rocked" and "Have You Ever Needed Someone So Bad". Their 1993 album, Retro Active, contained the acoustic hit song "Two Steps Behind". Their greatest-hits album Vault, released in 1995, featured the UK hit "When Love & Hate Collide". As one of the world's best-selling music artists, Def Leppard have sold more than 100 million records worldwide, and have two albums with RIAA diamond certification, Pyromania and Hysteria. They are one of only five rock bands with two original studio albums selling over 10 million copies in the U.S. The band were ranked No. 31 in VH1's "100 Greatest Artists of Hard Rock" and ranked No. 70 in "100 Greatest Artists of All Time". Def Leppard were inducted into the Rock and Roll Hall of Fame in 2019. This page uses material from the Wikipedia article "Def Leppard" (contributors), which is released under the Creative Commons Attribution-Share-Alike License 3.0. 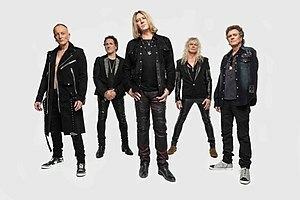 2018 image of Def Leppard band members: Phil Collen, Vivian Campbell, Joe Elliott, Rick Savage, Rick Allen.